A Hero’s Call 1.0 is now available for Windows *! **A note for JAWS users: A Hero’s Call only offers native support for the NVDA screen-reader, or self-voicing using SaPI. If you want to play using JAWS for Windows you will need to download and install a custom JAWS configuration file. A user-created configuration file, and instructions for setting it up, can be found in post #1076 of the A Hero’s Call topic on AudioGames.net, linked here. 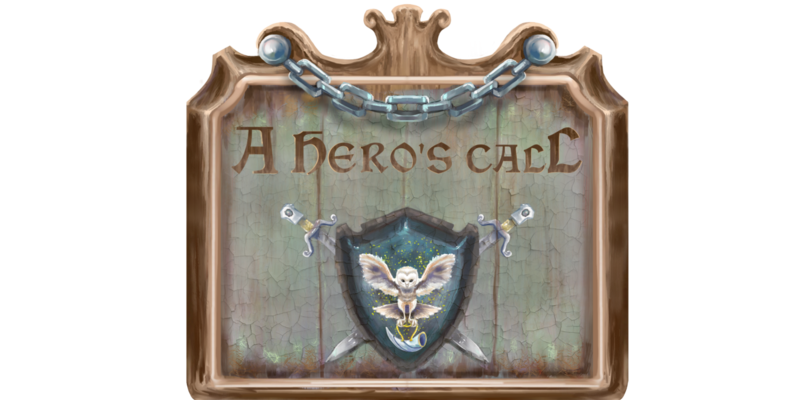 To Purchase A Hero’s Call, please enter your email address and click Buy Now to be directed toward a PayPal purchasing page. At the time of release, the game will only be available for purchase and download from this page. Future versions of the game (including the second major release with full graphics) will likely be available from other online game marketplaces. Thank you to everyone who contributed to our Kickstarter earlier this year! CLICK HERE to view the A Hero’s Call Kickstarter page to check on updates and news. Another major release of the game will feature full graphics and will not require the player to rely on accessible sound cues or a screen reader. Check back for more information on a release schedule for future releases. Experience exploration and adventure like never before! In the premier title from Out of Sight Games, you are a traveler thrust into a world of possibilities when you find the city of Farhaven under attack by a mysterious enemy. Along with a small band of allies, you must explore the surrounding lands, discover the identity of your enigmatic foe, and save Farhaven from certain conquest. Do you have what it takes to answer a hero’s call? Discover an expansive world – Venture forth from the town of Farhaven to explore mysterious forests, goblin-infested tunnels, haunted catacombs, and much more. With 17 unique maps, you’ll always have new lands to explore. Follow an innovative turn-by-turn beacon system to locations you’ve already discovered, or venture out on your own—you never know what you might find! Gather your allies – Expand your party with four unique allies; the feisty daughter of a powerful governor, a noble ranger with a troubled past, an idealistic priestess, and a sarcastic thief with a heart (and pockets full) of gold. Each brings their own skills and bonuses to the party, and opens up new possibilities in the world of Farhaven. Talking to your party members and traveling with them will open character-specific quest opportunities that delve deeper into each party member’s personality and history. Engage with a dynamic world – Meet over 40 NPCs, with dynamic behaviors and dialogues affected by your choices and actions. Some will fight alongside you, while others may have secrets to reveal. Build your character – Choose from one of six different classes, each with unique skills, and tailor your attributes for your specific style of play. Will you be a stealthy thief? A hardy warrior? A strong-willed mage? The choice is yours. Hone your skills – Gain experience to level up and learn new skills. With over 80 unique options to choose from, you can develop any combat style. Will you wield melee or ranged weapons? Strike down your opponents with the power of the elements, or attack from the shadows? Heal and defend with holy magic, or strike terror with the powers of necromancy? Customize your gear – Buy equipment from shops, take it from fallen enemies, or discover it as you explore. With hundreds of items to choose from, you will always be able to choose the armor and weapons that best suit your character. Test your might – As you explore, encounter over 70 different enemies—from bandits and wolves to giant spiders, golems, and dragons, you will never be lacking for foes to vanquish. Turn-based combat provides comfort for players of all skill levels, while positional audio puts you in the center of visceral, action-packed battles. Build your legend – Whether you pursue the main story, or one of over two dozen side quests, you will be part of an epic narrative. And as you explore lands with a rich history, read lore in books and scrolls, and talk to the citizens of Farhaven, you’ll feel like yours is just part of a much larger story. A Hero’s Call’s audio is powered by FMOD Studio.